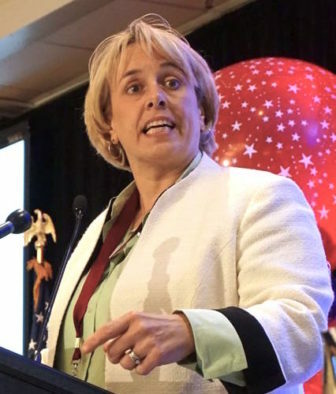 Connecticut’s cities and towns unveiled a sweeping financial plan Wednesday that included a major sales tax boost to aid communities, new regionalization incentives and collective bargaining changes. The bargaining changes would be designed to ensure new revenue for towns would not be used to boost wages and benefits for municipal workers. 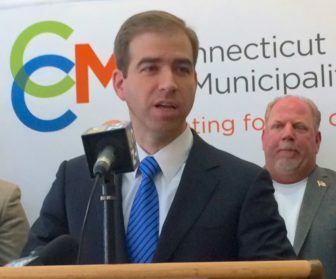 And while the plan the Connecticut Conference of Municipalities unveiled in Wethersfield was aimed at communities of all sizes, Hartford Mayor Luke Bronin predicted this approach would enable the capital city to avoid insolvency and would boost struggling urban centers statewide. The proposal could place Democrats in the General Assembly in a political quandary, leaving them caught between public-sector labor — a strong part of their political base — and a long-established priority of easing property-tax burdens. Another controversial provision would impose fees on property-tax-exempt nonprofits, such as private colleges and hospitals, in the event that certain state grants are curtailed in future years. Bronin, who began warning last year that Hartford was at risk of bankruptcy unless state officials reform how major cities are financed, said he believes this plan would lead the capital city out of financial danger — and then some. 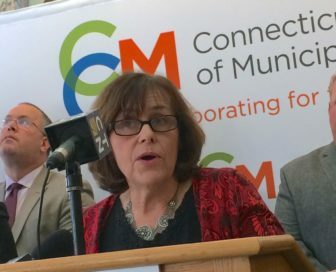 The plan was developed by a working group of 22 mayors, first selectmen and town managers from major cities, suburbs and small rural towns, said Joe DeLong, executive director of CCM, which represents 163 of Connecticut’s 169 municipalities. Though the initiative aims both to control local spending and diversify revenue options for communities — which rely chiefly on property tax receipts and state assistance — perhaps the most controversial component is tied to the state sales tax. CCM would both broaden the sales tax — canceling various exemptions — and boost the rate to 7 percent. Connecticut has nearly $4.1 billion in sales tax exemptions on the books, according to the legislature’s nonpartisan Office of Fiscal Analysis. But that doesn’t mean repealing all of them would pump $4.1 billion into the state’s coffers. Because charging sales tax on some goods and services would lead consumers to purchase less, nonpartisan analysts estimate the most the state could recover by canceling all of these exemptions is about $2.9 billion. Many are very popular, longstanding exemptions involving items such as groceries, gasoline, medicine and medical equipment. Other exemptions, such as those for winter boat storage and some recreational services, are more controversial. CCM did not recommend which exemptions to eliminate, but estimated about 10 percent would need to go. The second phase of the conference’s plan would boost the overall rate to 7 percent. This change, coupled with the broadening of the tax, would yield about $700 million in additional revenue each year — and those funds would be dedicated to cities and towns. Distribution would be weighted, in part, in favor of communities with large quantities of state-owned land and buildings and private colleges and hospitals — all of which are exempt from local taxation. Another portion of the sales tax receipts would be distributed based on a formula shaped largely by population and population density. There also would be an opportunity for sections of the state, voluntarily, to increase the sales tax rate in their particular region even further — and keep the funds to support tourism, recreation and other regional activities. If supported by a regional council of government, and by favorable referenda in the affected communities, a region could add one-quarter of 1 percentage point to the new base of 7 percent rate for all goods and services. In the same way, a region could impose an additional 1 percentage point to the 7 percent rate — only on restaurant food and beverages and on hotel accommodations. To make the sales tax increase more appealing, CCM also unveiled a proposal to demonstrate that this new revenue for towns would not be spent on raises or benefits for municipal workers. Specifically, the proposal would amend collective bargaining rules regarding binding arbitration — a process cities and towns routinely go through each year to settle compensation for teachers, police officers, public works staff and other unionized employees. Critics of the binding arbitration system — which weighs past compensation levels, decisions in neighboring communities, and a municipality’s wealth and capacity to pay employees — have argued it favors labor and has driven excessive municipal compensation and benefits for decades. CCM’s plan calls for new sales tax dollars dedicated to communities to be exempted from the arbitration review process. In other words, an arbiter could not weigh those grants when assessing a community’s ability to afford worker raises. Similarly, CCM’s plan also would revise collective bargaining laws to make it easier for neighboring towns to economize and provide services on a regional basis. The plan would exempt new services provided regionally from collective bargaining. And if two or more communities wanted to merge existing services provided by unionized employees, compensation for those workers would have to go through a new collective bargaining effort, rather than being tied to conditions set in previous union contracts. Unionized municipal employees are hard-working and — often — residents of the community or region where they work, Pelletier said, adding that they shouldn’t be singled out to solve the fiscal woes of cities and towns. House Speaker Joe Aresimowicz, D-Berlin, an education coordinator with the American Federation of State, County and Municipal Employees — an influential public-employee union — also has not closed the door to a state tax increase to help close a deficit in the next state budget without burdening municipal budgets. He issued a cautious response Wednesday to the CCM proposal. Gov. Dannel P. Malloy already has said he won’t propose any major state tax hikes to help close the projected $1.4 billion deficit in the next fiscal year. A recommendation that the state government assume all financial responsibility for special education and the delivery of those services. Amending the Municipal Employees Retirement System to allow for a revised retirement plan for new hires. Restoring a state grant program to encourage regionalization of services.